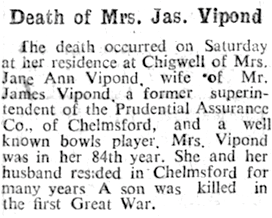 Sidney James Vipond came to Chelmsford with this family around 1906 and was educated at the Friars Council School and King Edward VI Grammar School. Later he worked as a clerk in Lloyds and the Royal Exchange before joining the army five weeks after the outbreak of the war. He gained an officer’s commission in January 1915 and arrived in France in August that year. He was fatally wounded by shrapnel near Ypres in April 1916 and died two days later on his 24th birthday. His home was in Park Avenue. “Second-Lieut. Sidney James Vipond, of the Bedfordshire Regt., who died from wounds on April 20, was a son of Mr. and Mrs. J. Vipond, of Silverdale, Park-road. Chelmsford. Deceased was wounded by shrapnel in the abdomen on April 20, and died later in the day – which by tragic co-incidence, was his 24th birthday. Sidney was born in Gateshead, County Durham on 20th April 1892, the son of James Vipond and Jane Ann Vipond (nee Bell). Sidney’s father had been born in 1865 in Garrigill. Cumberland; his mother in 1876 in Allendale, Northumberland. The couple had married in Alston, Cumberland on 8th January 1891. Sidney’s siblings included Amy Mary Vipond (born in 1898, died in 1973) and Vernon Kenneth Vipond (born on 12th November 1899, died in 1960). Both were also born in Gateshead. The 1901 census recorded eight year-old Sidney with his parents, two younger siblings and two visitors at 37 Roseberry Avenue, South Shields in County Durham. At the time his father was an insurance agent. Prudential Assurance Company living at 33 Park Road, Chelmsford, also known as ‘Silverdale’. Sidney was bursar from the autumn 1908 term until he left the school on 7th April 1909 in Form VI, with the Oxford Junior Level qualification. He was a member of the school’s Cadet Corps. 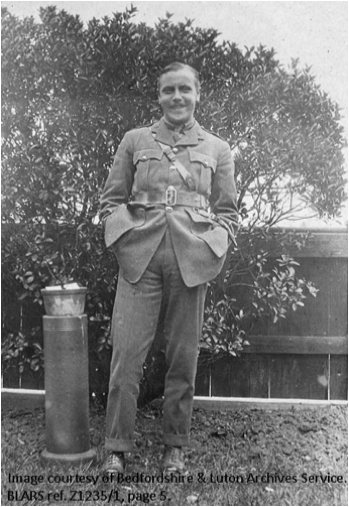 His brother Vernon also attended the Grammar School, from January 1915 to July 1917. In 1911 the census listed 18 year-old Sidney staying as a guest at a private school at Holt House, Chestnut in Hertfordshire. He was employed as a clerk at Lloyd’s. He subsequently worked at the Royal Exchange in London. Meanwhile his parents remained at 33 Park Road. Sidney’s father was a prominent member of the Falcon Bowling Club in Chelmsford, and its chair after the war. Five weeks after the outbreak of the war and when aged 22 he enlisted into the 17th Battalion of the Royal Fusiliers on 9th September 1914 at 3 St. James’ Court, Westminster, London. At the time he was aged 22 years and five months old, and five feet ten and a half inches tall, and weighed 147 pounds. He had a fresh complexion, blue eyes and fair hair. He was a clerk living at 33 Park Road. He became Private 262. On 14th January 1915 Sidney completed his application for a commission as an officer, stating that his preference was to join the 8th (Service) Battalion of the Bedfordshire Regiment. At the time his unit was based at Whyteleafe in Surrey. Thomas Hay, Headmaster of Chelmsford’s Grammar School, certified that Sidney had reached the necessary level of education to be an officer. Sidney’s commission was quickly approved, on 26th January 1915. He then trained with them until they were mobilised. On 28th August 1915 having completed its training the 8th (Service) Battalion of the Bedfordshire Regiment, including Sidney, boarded a troop train at Chobham Station and left for Dover where it transferred to troop ships. It landed in Boulogne, France on 30th August 1915. Sidney’s battalion saw action at the Battle of Loos in September 1915 and the defence of Ypres in Belgium in 1916. On 19th April 1916 Sidney was in trenches on the Yser Canal Bank near Ypres, subject to heavy German bombardment which caused many casualties. That night a German raid captured part of those trenches held by Sidney’s battalion and in the dark nearly 250 casualties were suffered, including over 130 men missing or killed. Sidney was wounded in the action receiving shrapnel wounds to his abdomen and was dangerously ill by the time the 17th Field Ambulance got him to No.10 Casualty Clearing Station at Lijssenthoek that afternoon. Closer inspection at the station revealed further wounds to his legs and hand but he died at 4.45 p.m. the next day (20th April 1916) from those wounds. It was Sidney’s 24th birthday. Today he lies at Lijssenthoek Military Cemetery, some 12 kilometres west of Ypres (grave: V. A. 21). “News reached Chelmsford on Good Friday of the death of Sec-Lieut. 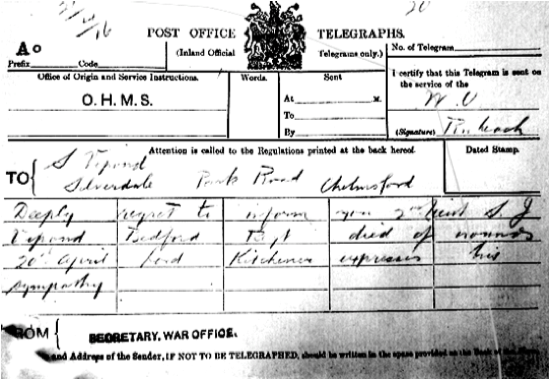 Sidney James Vipond, of the Bedfordshire Regt., son of Mr and Mrs J Vipond of Silverdale, Park Road, Chelmsford. The young officer was dangerously wounded in the abdomen by shrapnel on April 20th, his 24th birthday, and he succumbed to is injuries later in the day. Although so badly wounded he dictated a cheery letter home. A bright letter from him, written in the trenches, was also received soon after the telegram announcing his wound. The deceased was a smart, well-built, and popular young fellow, liked by everyone. He was educated at the King Edward VI School, Chelmsford, and after spending time at Lloyd’s went into the Royal Exchange, where a brilliant career for him was confidently expected. Shortly after the outbreak of war, on September 9th, he enlisted in the Royal Fusiliers, and on January 9th of last year was given a commission in the Bedfords proceeding to the Front last August. Sidney’s possessions, which were, posthumously returned to his family were: a tie pin, a pencil, an identity disc, a photograph, 11 leather buttons, 2 gold rings, a cigarette case, a letter, a notebook. a diary with visiting cards, a stud, two metal stars, and a luminous wrist watch (inscribed ‘To Reggie from his Missus, 1914) & strap. Sidney is commemorated on the Civic Centre Memorial, Chelmsford and by the Chelmsford Parish Great War Memorial in Chelmsford Cathedral. He was entitled to the Victory, British War War and 1915 Star medals. The 1918 register of electors listed his parents still at 33 Park Road, Chelmsford. 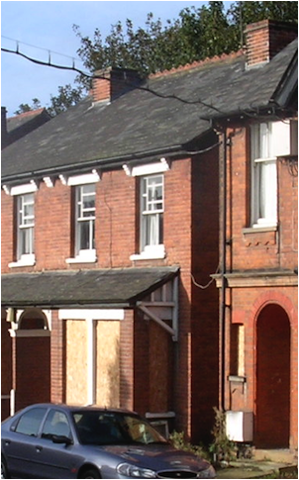 The house was demolished in 2006-7. Sidney’s mother died in Chigwell in 1948; his father died there two years later.